As people get older, many of us end up looking back and cringing at dubious fashion choices. Many look back on the sixties and blush at the flared trousers and headbands they sported in the summer of love. Just as many are horrified by their eighties getups, with the Flock of Seagulls haircuts or the big frilly shirts of the New Romantics. However, the 1970s, a decade probably just as ridiculous for fashion as the ’60s and ’80s, seems to be regarded with a certain affection. The decade of ABBA, the Jacksons and Elton John has become a favoured source of inspiration for anyone dolling themselves up for a fancy dress party. Indeed, 1970s fancy dress parties are becoming a favoured past time of partygoers all over the country. With a range of costumes and accessories, such as GoGo boots, Afro wigs and Elton John-style glasses, there is a great range of wacky wear to choose from. Believe it or not, 70s fancy dress parties started being popular in the 80s, so they have enjoyed an almost instantaneous popularity, and there is now a wealth of costume makers catering for 70s aficionados. This means it’s both easy and fairly cheap to put together a knockout 70s outfit in a flash. 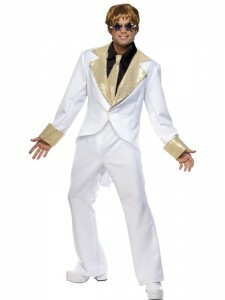 Furthermore, it is easy enough to choose your costume, with many combination’s of clothes to get the necessary 70s gear. If you fancy having an outfit to keep, you could pair a miniskirt with a pair of GoGo boots and some oversized sunglasses, or a brightly coloured mini-dress with some ostentatious costume jewellery. Then again, if you are not the type who wants to overload your wardrobe with clothes you never plan on wearing again, you can hire a costume from a website or a costume shop. This can be a great opportunity to get a really ostentatious outfit. You could go for a jumpsuit paired with some GoGo boots and an Afro wig, perhaps with a large false moustache, or even some stick-on chest hair. It might be itchy, going to the bathroom might be a little bit of a struggle, but you’ll really be getting into the 70s fancy dress party spirit. So dressing up for a 70s fancy dress party is incredibly easy these days, especially as many of the fashions have returned to the high streets. Playsuits, similar to a jumpsuit with shorts rather than full trousers, are popular summer wear, while GoGo boots have enjoyed a renaissance, paired with jeans, skirts and even worn on men. Flamboyant male celebs such as Russell Brand and Noel Fielding have started pulling on the GoGo boots when they step out. So while fashions are generally looked back on with regret, shame and derision, but 70s fashions have somehow survived through the popularity of 70s fancy dress parties. This popularity has even managed to sneak the outfits back into the public consciousness, with the clothing now a regular feature of the high street. ABBA may be gone, but their spirit clearly lives on in the nation’s wardrobes.